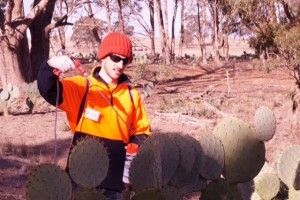 The Loddon Plains Landcare Network launched it’s 2015 Wheel Cactus Control Program at Mt Buckrabanyule on Sunday 19th April. Ron Kerr Jr from Dja Dja Wurrung provided a Welcome to Country before the Loddon Shire Mayor Cr Gavin Holt officially launched the program with Landcare Facilitator Anthony Gallacher (see right). 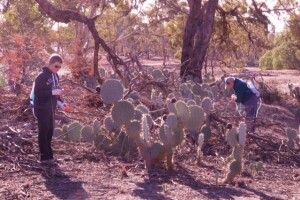 Armed with spear guns and hoes, 25 volunteers tackled an infestation along a drainage line during the afternoon, making significant headway on many cactus specimens. 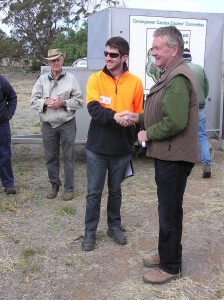 Ian Grenda from the Tarrengower Cactus Control Group also provided a demonstration on the use of Dacaonate versus Glyphosate as a Wheel Cactus treatment. Thanks to all who attended the launch and assisted in making it a success. 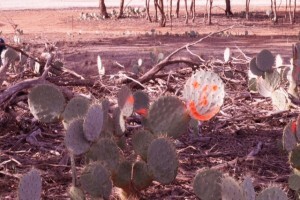 The Network will continue to run working bees with the assistance of the Wychitella District Landcare Group to tackle Wheel Cactus at Mt Buckrabanyule and surrounds. 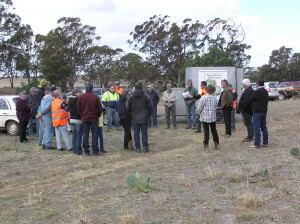 The event was funded through a Communities for Nature Grant from the Department of Environment, Land, Water and Planning and supported by the Loddon Shire and Buloke and Northern Grampians Landcare Network. Photos supplied by Malcolm Cousland and Chris Rothacker.